What did parents of travelers think of their child's immersion program? We often hear that the most rewarding part about being the parent of an Xperitas traveler is seeing the individual transformation that occurs in their children during and after their program abroad. While many parents speak directly to the positive impacts of their child's cultural and language immersion experience, from things like improved self-confidence to sharpened language and cultural competency skills, many parents also mention that the Xperitas program was a learning experience for their entire family. Wtih that in mind, we've compiled some stats and comments from parents below from our post-program surveys from our recently completed Spring 2018 travel season. 94.72% of parents surveyed were satisfied with the overall experience of working with us on their child's immersion program. 94.32% of parents surveyed were satisfied with our trip preparation support. 98.07% of parents surveyed reported improvements in their child's global competency skills. 95.88% of parents surveyed reported an increase in their child's confidence. Over half of parents surveyed said their child's Xperitas program was a significant learning experience for the entire family. Here are some of our favorite quotes from parents of our spring 2018 travelers. Our family has been travelers. I ( mom) have lived in the Netherlands and the UK. My kids have traveled since they were babies to UK, France, Sweden, Japan, and India. For us, this was a great opportunity for my daughter to travel without a parent and get to experience her own autonomy in a real way. That has been very profound for our family and inspiring for her and what she can do in life. She even worked to pay for 1/3 of her trip. It has been very motivating. thank you. She is more confident about herself having seen how her travel mates were homesick, confused and immature about being away from home and having to do things for themselves without an adult. She took a leadership role, having had much experience with travel and helped others. She is now much more self-determining than before and positive in her outlook about herself and her future. We learned some about France, since our son loved the sightseeing and excursion part of the trip, and we also learned personal things about our son. This was a good opportunity to experience being away from home in a foreign environment for a short time -- a prelude to college and possible future stays. Our son gained experience, confidence, and tools. She came back more confident and comfortable with herself. She learned to be independent and to trust her decision making. She experienced what it would be like for her if she lived in Costa Rica, the real world, not only the tourist side. She also made friends and learned to adjust to her surroundings and make the best of what was available. He seems more flexible. That's so great for him !!! He got out of his comfort zone with new people new language new food!! And he grew up a bit !! He's much more interested in travel and the world beyond our country. We are so pleased!!!!! She has suffered from anxiety for years so we were very worried about sending her to a new country. But she just flourished! She had very few panic attacks and learned to make decisions on her own. I'm so proud of the child that came home to us. She experienced firsthand the language difference and was surprised at the knowledge she had of Spanish and how she was really able to communicate well. Her confidence grew also as she was able to navigate through the cities and make her own choices and plans, and also her leadership skills as she worked with a large group and the dynamics that can bring. Her experience of another culture and country gives me much joy. Her experience living with another family was amazing. Seeing her grow and leave part of her heart with her Spanish family makes my heart very happy! She will ALWAYS remember this experience. It has given her another experience to mold her into who she will become! Seeing her smiling face at the different experiences she had - especially the flamenco dancing. Listening to her tell stories about problem solving situations with transportation and logistics and how they worked through some pretty stressful situations on their own. I went on this same trip with one of the same chaperones when I was in high school, so it was pretty cool to compare her experience to mine and share that adventure with her. Watching and listening to her excitement as she handed out the gifts that she bought for various people back home. Overall, He got to visit many places in Spain. Good mix of common places as well as personal ones with family. His particular family did not speak any English and my son gained confidence as he was able to communicate with them. It seemed a good mix of planned activities as well as free time to explore his interests. He enjoyed the trip and I am grateful he had this opportunity with Xperitas. We felt confident he was well prepared. I am happy to have see Sabrina excel in all areas of her experience, from the interpersonal relationships with her host family to her leadership and empathy with her fellow travel mates ... It was a great opportunity for my daughter to show her true strengths and colors. She was valued and appreciated, and that has been a joy to see her be at her best and recognized in such positive ways. In the words of my daughter, "This was a life changing event." It made a significant impact on her, she felt safe the entire time she was there, and said the the Xperitas support was very smooth. Unfortunately for us :-) she's hooked on Spain and is planning to travel back this summer. It was great to see my daughter so happy. She has never been this happy. She needed a vacation from all the stress and some time to herself and she finally got a break from school and sports and work and she was in heaven for a week and a half. I am so glad that she got to experience that and know that one day her life won't be as stressful as it is now. She got a taste of how she could be living after high school and college. I just can't tell you how much she loved this trip. It's a little scary that she wants to go back so bad and study abroad when she is in college but it had that much of an impact on her. Our son went two years ago also through the same program and his experience was also amazing but for some reason this experience really left an impression on her. She gained so many friendships with kids from Spain and even became closer to some of her classmates that she hadn't known very well and now has strong relationships because they went through the experience together. She and her new friend already have plans to go back the first week of July and have an offer from one of the host families to stay at one of their beach houses. How are we ever going to get her to want to come home again??! Our greatest joy was seeing our son, who has struggled with social anxiety and is a big introvert, take on and then navigate a challenging situation. He learned more about himself and gained a lot of confidence that he could get through something that was challenging at times. I also loved seeing our son really enjoy being in and seeing another country. 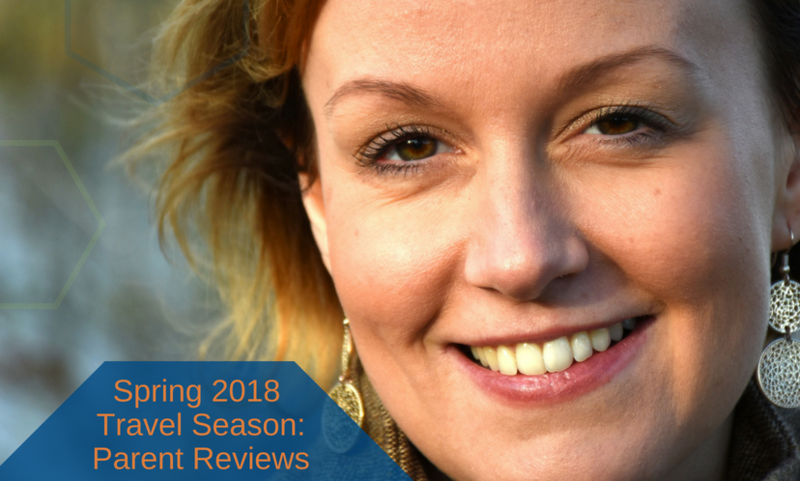 To our travelers and their parents, our language teachers, international partners and our dedicated and hardworking program management staff, THANK YOU for a successful Spring 2018 travel season. We will continue advancing our mission of transforming lives through shared global experience and intercultural learning in the summer of 2018 – and beyond!